Here we have a unique take on rock…Love Ghost is an alternative rock band from Los Angeles, and I say unique because they are young (two members are still in high school) and they are very candid about their mental health and social difficulties which has informed their songwriting, their performances and their attitudes to life in general. Needless to say this journey into the light is strewn with some dark and disconcerting imagery. Remarkably, they have already achieved a lot, having opened live for Buckcherry, Berlin and Smash Mouth. Heavily influenced bygrunge and heavy rock bands from the 90’s including Nirvana, Smashing Pumpkinsand Alice In Chains, their sound has one ace that makes it not quite as predictableas that may sound…they include in their number a rather gifted viola player andshe uses the versatility of that instrument to throw atmosphere and mystiqueinto most of the songs. 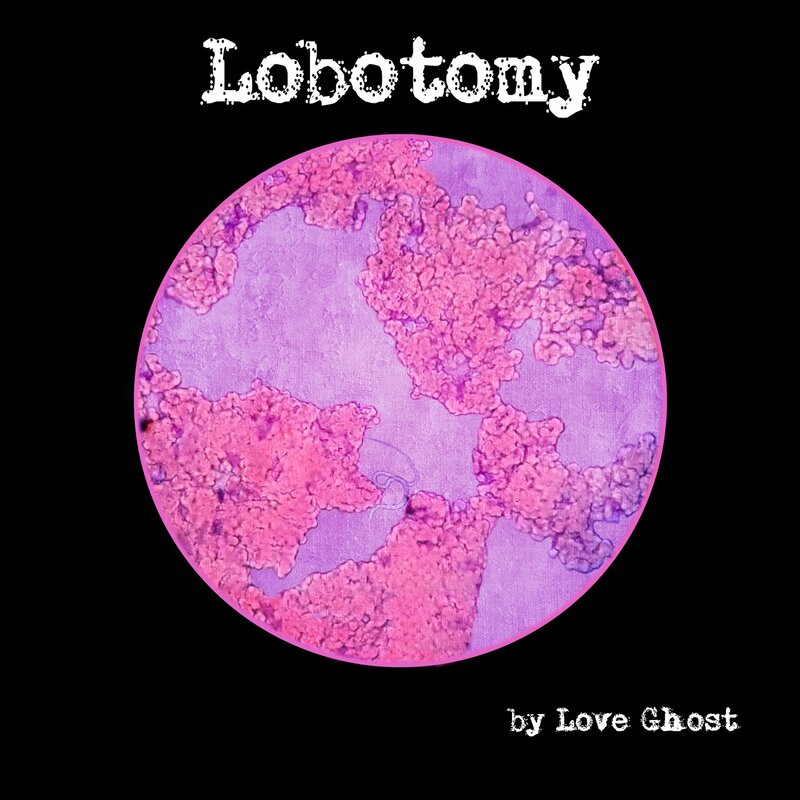 Lobotomy is their full-length debut consisting of thirteen tracks, and they are about to launch their music to a wider audience as they are touring The Republic of Ireland in December and January. (Please bear in mind that this review is based on a streaming link with horrible compression, so some of the muddiness may not beapparent on the proper release). Opening track Girl Pusher opens a bit Alice in Chains in the riff style with the viola showing straightaway how a delicate instrument can sound angry as it counterpoints the riff. Vocally, I guess the Cobain references will appear, although they have youthful rawness that his never did. There are some complex time changes that alleviate the weight. Not exactly my normal fare but, compared to some alt.rock around this is as good but different. TheScarlet Letter starts slow with a less fuzzed guitar and restrained vocals and gentleguitar; the viola again adds colour and intensity to the otherwise archetypal grungy sound. Parasitical Identity doesn’t really reveal the song content; itis (I think) addressing the depression that has struck the composer. This isover a more rock-based structure with some eastern influences to the guitarpattern. It soon devolves into grunge however, and this loses the chance to bemore reflective and unique. Nowhere is perhaps the most instant track on thealbum, and with some of the cleverer and deeper lyrics… “From thiseverywhere in my head to a nowhere in my soul”. The interrupted rhythm ofthe drums with the viola exploring the edges makes it more accessible too. Danny Boy is the Irish song beloved by many. My favouritehas always, and remains, the instrumental version on the Funky Junction PaysTribute to Deep Purple album. Here it is a dirge with little of the lyricalnature of the tune surviving. It is a brave and clever adaptation, albeit not for me…but it will be interesting to see how it is received during their visitto the song’s homeland. 24/7 is Cobain singing over the lovey viola tonesbefore the grunge chords cut in and out over the running time. I think, becausethey rely less on the fuzzed and muddy guitars and concentrate more, andharmonise with the tuneful nature of the viola, that this has to be my clearfavourite. The next two tracks, Tall Poppies and This Is The Truth are twoslower tracks that have a Celtic feel because of the viola interpretationsalthough they almost blur together. Dead Silence has the best riff on the album and if that complexity had been surrounded by non-Nirvana guitars and instead had a cleaner and more melodic approach, this could be so much better. TheUnderground shows Mya’s viola off to startling effect as, after a slow start it does, eventually, build into an orchestral sweep. 9mm conjures Nirvana againwith its bare bass sections and the main riff. Naked is an instrumental that actually has some guitar breaks in it, and more of that crafted viola. It isn’t bad, I’m just not sure where it was headed with frantic guitaring over a plodding back line…another opportunity missed in my opinion as the viola linescould have been expanded upon and echoed more musically without reverting tothe grunge chords. In My Head Again closes the album with nearly seven minutesof a strange and ultimately confusing mix of grunge and a temp and vocal approaching thrash. Overall, this young band shows a remarkable maturity and a skilled approach to their chosen genre. For me, it is a case of what could have been…the backgrounds of the individual members embrace rock, classical metal and jazz and if they would resist the tendency to grunge up everything and use their obvious skills to take advantage of and blend their musical backgrounds, I am confident they could produce something different and thereby attract a wide and appreciative audience. Instead, they have delivered an album that, despite the creative breadth the viola has brought, is a fairly typical alt.rock/grunge album that will not stand above the rest of the pack. In sayingthat, if you love the alt.rock and grunge style across a whole album, you willprobably find a lot to like in this. Musicians: Finnegan Bell: guitar, vocals Samson Young: drums Mya Greene: viola Ryan Stevens: bass Produced by Eric Lilivois at London Bridge Studio in Seattleand NRG Studios in Los Angeles. ← Wailing Recluse remains reclusive…and wailing!